The summer of 2017 marked fifty years of traveling ministry for the family of Levoy and Cleon Dewey. One page on a website cannot contain the stories that unfolded during that span of time, so books are being written. There were struggles, laughable moments, joys, dilemmas, disappointments, a ton of bus tales, fourteen years of schooling for the girls, many answered prayers and miracles….so many miracles. Only a few months prior to their departure, there was a news flash on television that Israel had become a state. As Levoy sat in his office at Calvary Temple in Springfield, Missouri, where he was preparing music, a sober realization struck the core of his spirit. His Grandpa Dewey had spoken about such an event that would signal the end times. The countdown had begun. This was the time for him to gather his family and embark upon a journey that he’d dreamed about since he was a young boy. His thoughts raced back to another place and time. It was something that happened in a wheat field in western Nebraska, where the teenager was on a tractor plowing when he heard the voice of the Lord. Whether it was audible, he cannot say. The sound of that voice came out of a cloud of dust…so loud and clear. “Be faithful and I will use you before I return.” Those few words were seared into his mind. The kid often pondered how this could be. Throughout some difficult seasons in his youth, he remembered and was drawn back to his calling. It was a hot August day in 1967, when a well-worn, eighteen year old bus rolled onto the Nebraska Camp grounds. It was carrying “The Singing Dewey’s” to their first engagement. Levoy jokingly said the bus was old enough to vote when he bought it from “The Envoy’s”. On board were Levoy’s brother Tim and his wife Sheryl, Levoy, Cleon and two little girls who were three and four years of age. When they drove away from their jobs and all semblance of stability, this was the only booking on the calendar. Hopes were high, knowing there would be plenty of pastors in attendance, and the opportunities would surely come. Indeed, doors opened wide for the new group. After three years of crisscrossing these United States without the conveniences of a home, “The Singing Dewey’s” settled in Nashville, Tennessee. The thriving little city was centrally located and they’d recently signed with Sumar Talent Agency and Heartwarming Records. About once a month, the six travelers made their way back home for a few days to prepare for the next tour. The pressure was always on to sell more and more records and keep the schedule full. Most of the concerts were booked through the agency with “The Oakridge Boys”, “The Downings”, “The Spear Family”, “The Happy Goodmans”, and many other popular groups of that era. It was fun to be on the circuit with these outstanding people, but something was missing. Concerts left little room for ministry, and church dates were becoming second place. Traveling long distances between engagements was difficult. That’s when Dad Dewey started driving the bus, which he did for ten years. Mom Dewey remained at home and ran Luigi’s Pizza. God opened the door for “The Singing Dewey’s” to experience their first overseas missions trip to Panama, Central America. Marvelous things happened when the fire for foreign missions got inside their bones, and it literally changed them forever. Tim and Sheryl left the group after five years and started their family. They continued making albums and did their share of traveling between church assignments. At the time, Cindy and Susie began playing instruments and started singing with their Daddy. Mommy played the piano. Along with the addition of more musical instruments, the name evolved to “The Dewey’s”. Some very dear friends,”The Couriers”, advised Levoy to always drive a new bus, because you pay for one in repairs anyhow. They added one more piece of advice….tithe your time on the mission field. Tithing their time overseas seemed to be impossible. The costs of airline tickets and overweight, which was normally a ton, was a big pill to swallow. However, these challenges never failed to encompass tremendous blessings for them and those to whom they ministered. There was the missionary’s kid in Colon, Panama, who was struggling to play a busted guitar. When “The Dewey’s” plane climbed high above the tropical clime of that beautiful country and headed for Nashville, there was a very happy boy in Central America, holding a fine instrument they had given to him. It was not unusual to plant a public address system, an instrument, or perhaps a few hard-to-come-by items in the hands of a missionary or worker during their stay. What really matters are the lives who were touched, just because a little family surrendered to God’s will. Fifty years have passed since the fire for evangelism fueled their decision to leave a conventional way of life. The same fire still burns today. For more than twenty years they averaged 300 services per year. In the backstairs hallway of the family home that they’ve occupied since 1972, there are some gold records and other accolades on the wall. “Why in the backstairs?” That says it all. The tokens of recognition on the wall are appreciated, but not what matters most. “The Dewey’s” did not set out for fame or fortune. Grandpa was right. The end times are here and this is the midnight hour. 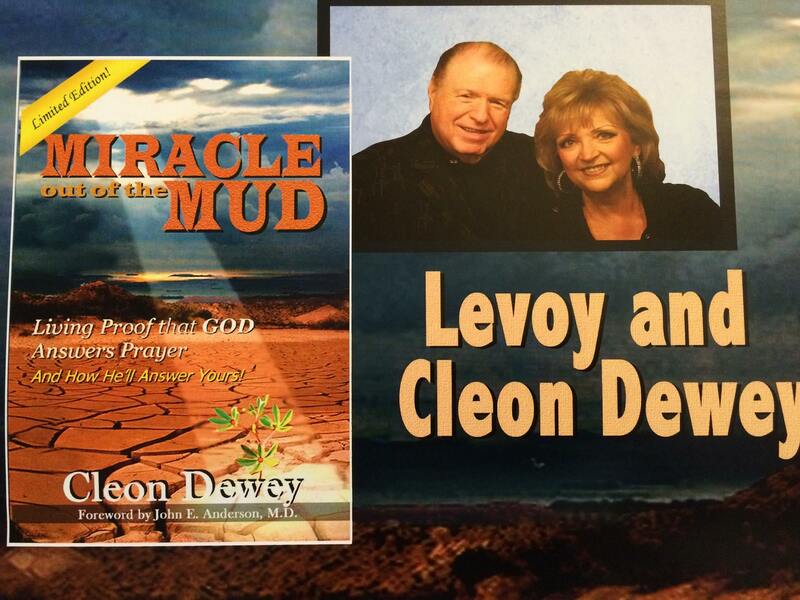 Until He comes, Levoy, Cleon and their family will be winning the lost, praying and believing for the sick to be healed, and encouraging the people of God to keep the faith. JESUS IS COMING SOON!!!!!! !